What Day Of The Week Was May 13, 1958? 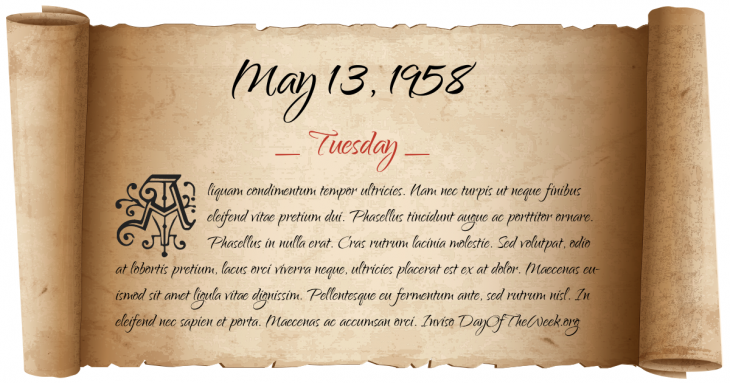 May 13, 1958 was the 133rd day of the year 1958 in the Gregorian calendar. There were 232 days remaining until the end of the year. The day of the week was Tuesday. A person born on this day will be 60 years old today. If that same person saved a dollar every day starting at age 4, then by now that person has accumulated $20,797.00 today. During a visit to Caracas, Venezuela, Vice President Richard Nixon’s car is attacked by anti-American demonstrators. May 1958 crisis: a group of French military officers lead a coup in Algiers demanding that a government of national unity be formed with Charles de Gaulle at its head in order to defend French control of Algeria. The trade mark Velcro is registered. Who was born on May 13, 1958?